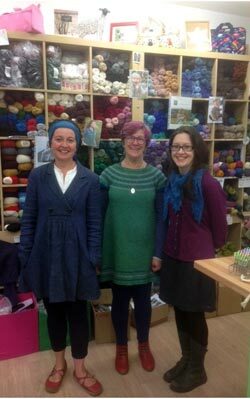 About Kathy's Knits - A Knitters Haven in Broughton Street, Edinburgh. It was my grandmother who got me started at the age of four. She taught me those first few fumbling stitches. What I didn’t know then was that knitting was in my blood and these were to be the first of millions. I learned that my mother’s family originated from Shetland and that knitting is part of my heritage. Over time I heard all the stories about how the women on the Isles sat knitting furiously from their wheskers (knitting belts). It wasn’t a hobby to them. In Shetland it was essential. It was a real treat in later life to go to Shetland to experience it all for myself. Since those early days, I’ve been lucky enough to travel the world and visit some amazing yarn shops and farms from New Zealand to Hong Kong, from Spain to Australia. Each stop has given me fresh ideas and inspired me to tackle new projects. My family and friends have never been short of things to wear! During that time, I went back to college and spent 3 years completing a diploma in design. This gave me a proper grounding in texture, colour and design and how best to blend all three. It was invaluable. So, when it came to chosing yarns for the shop, the choice was easy. Scotland and the rest of the British Isles produce some of the best yarn in the world! If you’ve not managed to make it along to the shop yet, I hope you get the chance soon. I look forward to meeting you, sharing ideas and hearing all about your latest project. This is exactly the type of environment we want to create at our shop. 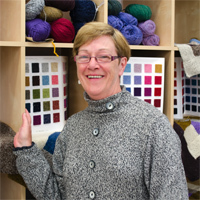 Kathy’s Knits is a place where knitters of all ages and standards can come for an enjoyable shopping experience. Where you can can get answers to questions and practical help from other people. A place where you are encouraged to take your time, feel the texture, enjoy the colours, and make the right choice. It’s sad that shopping has become so impersonal, and I want to do my bit to change that. I want you to have an enjoyable experience at Kathy’s Knits, so you want to come back again – even if its just to pop in for a chat, have a browse or knit a few rows. You are always assured a warm welcome. Here are my top 10 tips for anyone just starting out. Use good quality supplies. A decent pair of needles and good quality yarn. Choose the right needles. Start with wooden as the yarn will to stay on better than metal or plastic. Use larger needles. You’ll knit quicker and spot any mistakes easier! Use natural yarn as it stays on your needles better than synthetic. Learn knitting jargon. For example K means Knit, P is purl. All these will make learning new patterns easier. Use patterns to help guide you in your knitting. Always buy enough yarn to complete your project. Make your first project something you really want. Learn from family and friends and other knitters. Develop good habits and create a knitting environment for yourself.